Gorgeous, golden, and bursting with two kinds of corn—both fresh kernels and cornmeal—this soufflé makes a great main course for a light summer dinner. The smoked paprika adds an intriguing undercurrent of flavor, but if you don’t have it on hand, simply leave it out or substitute a pinch of cayenne. You can make this soufflé during the winter and spring with frozen corn kernels, but don’t use dried basil; it tastes dusty and tired compared to the vibrant flavor of fresh basil. If fresh is unavailable, omit it. 1 Make the sauce: In the strainer, rinse the roasted peppers well under cold water. Pat dry with paper towels. Transfer to the bowl of the blender and add the water, olive oil, and salt. Blend until smooth, 20 to 30 seconds. Set aside. 2 Make the béchamel: In the large bowl, whisk together the flour, cornmeal, and paprika. Melt the butter in the medium saucepan over medium heat. Add the garlic and cook, stirring occasionally, until fragrant, about 1 minute. Remove from the heat, add the flour mixture, and whisk well to remove any lumps. Return to the heat and cook for 1 to 2 minutes, whisking constantly. Remove from the heat again and add the milk slowly, whisking constantly to remove any lumps. Return to the heat and bring to a boil, whisking constantly. Boil for 1 to 2 minutes, then add the corn kernels and continue to cook for 3 to 4 minutes, whisking until the sauce has thickened and the corn is cooked through. Remove from the heat and whisk in the Parmesan, basil, and salt. Whisk in the egg yolks and transfer to the large bowl. Set aside. 3 Preheat the oven to 400°F and position an oven rack in the bottom third. Generously butter the soufflé dish (including the rim), coat it with finely grated Parmesan, and tap out the excess. 4 Whip the egg whites: In the very clean bowl of the stand mixer, whip the 6 egg whites and the cream of tartar on medium speed until they form firm peaks. You may also use a hand mixer and a medium bowl. Be careful not to overbeat. With the spatula, gently stir one-fourth of the egg whites into the béchamel to lighten the mixture. Fold in the remaining whites just until there are no more streaks of whites. 5 Fill the dish and bake: Transfer the batter to the prepared baking dish and place on the baking sheet. Bake for 20 minutes. then reduce the oven temperature to 375°F and bake for 18 to 22 minutes longer, until set and firm to the touch. While the soufflé is baking, transfer the red pepper sauce to the small saucepan and heat through. Serve the soufflé immediately, accompanied by the sauce. 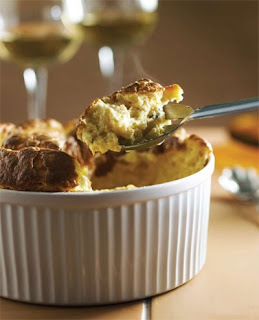 Prepare 7 (8-ounce) individual soufflé dishes with butter and Parmesan as described above. Place the dishes on a baking sheet and evenly divide the soufflé batter among them. Bake at 400°F for 15 minutes, then reduce the oven temperature to 375°F and bake for 7 to 10 minutes longer, until firm to the touch. You can get an even deeper corn flavor if you toast the cornmeal before beginning the recipe. Place a small dry skillet over high heat. When the pan is hot, add the cornmeal and toss or stir frequently until the cornmeal is very fragrant and has a golden toasted look, 3 to 4 minute —don’t let it brown. Immediately pour the cornmeal onto a plate to cool. The red pepper sauce can be made up to 2 days ahead and refrigerated in an airtight container. The béchamel can be prepared through Step 2 and refrigerated, a piece of plastic wrap pressed directly against the surface of the sauce, up to 2 days in advance. Reheat in a double boiler (or the microwave) before continuing with the recipe.